As the story of Rising Tide continues and we invite you to sit back and enjoy, Treasure Island. The damp air on the ship had brought out the mildewed smell of Rankin’s spellbooks. The mage struggled to cram the last tome into his pack. He eventually gave up and removed some clothes to make room. As he dragged the heavy bag to the rowboat, Rankin looked at the others who were preparing to go ashore. Two porters were doing inventory of cured meats and hardtack for the expedition. 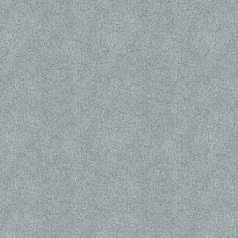 A bulky gargoyle named Forskis was staring up at the sky. Hook was giving some last minute orders to the crew of the Crown Jewel. The pirate lord was excited. If this expedition went well, the secret that the Guild’s leadership had kept for generations would soon be in his hands. The expedition had made good progress on the first day, but on the second, disaster struck. They had felt tremors all morning, but thought nothing of them. Hook heard the roar first. He shouted a warning as a river of lava flowed through the jungle around them. Rankin’s panic led to a hasty teleport spell, while Hook and Forskis scrambled out of the way. The two porters had nowhere to run. Only one of them managed to scream. As the survivors caught their breath, they took stock of the situation. The lava flows cut off the most direct route to their destination. Studying the map, Rankin considered the alternatives. “This path is shorter, but it might be blocked as well. Can your gargoyle scout ahead?” Rankin made flapping wings with his hands. Forskis shook his head and pointed to jagged scars along his wing patagium. Forskis picked up what remained of the dead men’s supplies and trudged into the jungle. The gargoyle drew a pair of curved knives and charged forward. His first stab took one of the eyes. The triton tried to close its jaw around Forskis to crush him, but the flurry of blades left jagged cuts along the creature’s flank. In agony, the triton gave up and tried to retreat, but Forskis wrapped an arm around its body and kept stabbing until long after it was dead. Rankin closed his eyes and focused for a moment. “The mana in this location feels strange. There is an entry here, but a spell is concealing it.” Opening his eyes, Rankin sat on the ground and started removing the library in his bag. “How long is this going to take?” asked Hook. Rankin had tried several standard counter-spells and poured water on the wall, but nothing at all had happened. Impatient, Hook had Forskis smashing large rocks against the wall. Consulting his books again, Rankin took a length of golden cord from his pack and started chanting. He whipped out the thin cord, and BOOM! Where the end had struck the wall, explosive magic was crumbling rock and burning away the spells there. When the smoke cleared, there was a cave mouth. They followed the narrow stone tunnel to a chamber which contained a large stone box. On its top was etched the inscription: “A Lawless Lord is the Crooked Key.” There was also an indentation in the shape of a keyhole. Forskis reached to pull off the stone top, but jumped back in extreme pain. Rankin examined the reliquary. “A minor magical trap. Give me a minute to disrupt it.” He read a chant from a book and focused the spell toward the stone chest. The mana from the spell rebounded onto Rankin. The mage fell to the ground as the arcs of energy wracked his body with pain. Forskis grabbed a bedroll and smothered the mana sparks, thumping the mage against the hard stone floor. “It mentions a lord. Rule of the Den is not passed by family, but by vote.” Hook took out a knife and made a cut. He smeared his blood against the lock. The stones of the reliquary opened, revealing what was inside: the Rune of Valor. Have you ever wanted to display a sinister looking cannon in your home? Does your ship look paltry compared to the foreboding cannons of the Plunderbeacon? Looking for your next Botswain? Now you can have all those things with the latest rewards available from the Pirate Merchant at Buc’s Den! 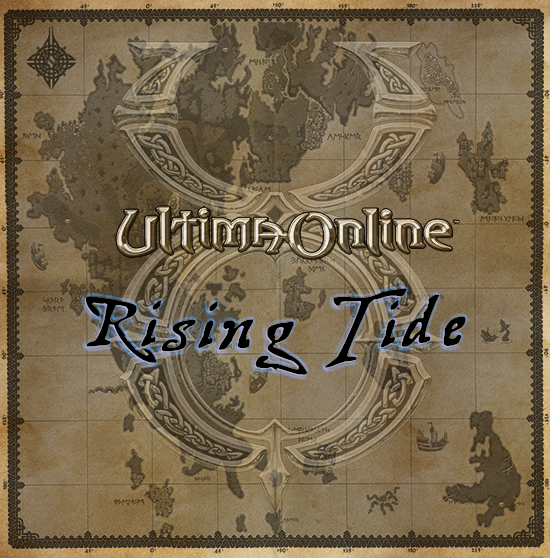 Get your new Rising Tide rewards beginning April 1st! 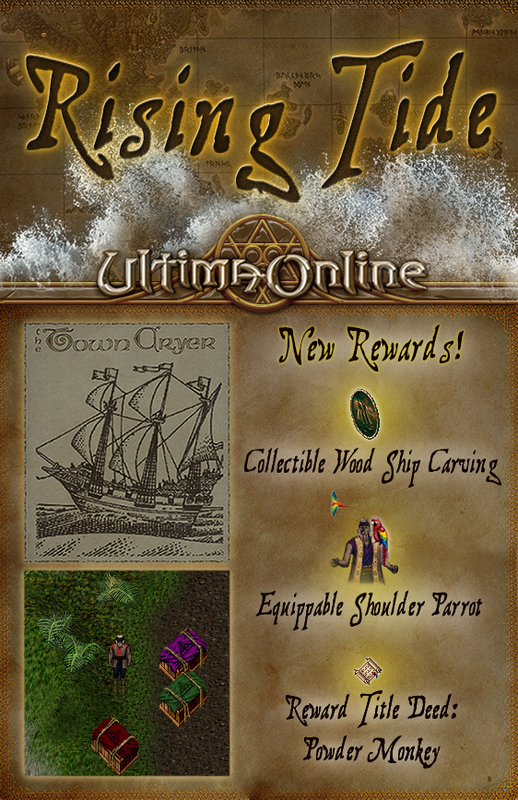 Want to get an early look at the latest rewards coming to Rising Tide? 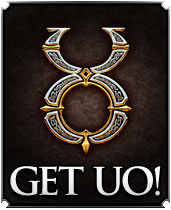 In addition to an early peek at new rewards and upcoming art additions, we’ll be sharing all manner of content related to Ultima Online! Don’t miss out, follow today! 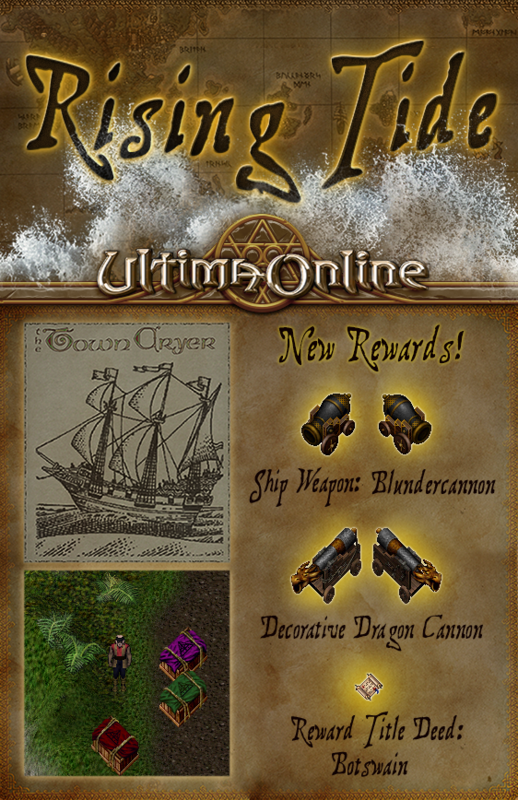 Rising Tide - a new event that takes advantage of re-designed ship combat for a harrowing High Seas adventure, with new rewards coming each month! Visit the Town Cryers to learn more! New Ultima Store Items - House Teleporter & Decorative Kitchen Set! Check out the full publish notes for all the details, and we'll see you on the High Seas! If you haven't been keeping up with the story so far, be sure to check out the Rising Tide fiction! If you have been keeping up with the official fiction over the last several years you are no doubt familiar with EM Malachi. EM Malachi has been a part of the EM program since its reincarnation in 2009 without taking a single break in service! I would like your help in thanking EM Malachi not only for his dedication to the program, but for his creative fiction that he has been writing. We are very lucky to have him on the team, thanks EM Malachi! Looking ahead to our next publish, Forgotten Treasures, we are working on the Treasure Map & Message in a Bottle revamp. We want to thank you all for participating in shaping our goals for this revamp by participating in the conversation on the forums. We look forward to sharing with you the first implementation when it comes to Test Center in the coming weeks. Keep an eye on UO.com for updates! Take to the High Seas and plunder Maritime Trade Cargo from Merchants and Pirates or if you are daring stand against the mighty Plunderbeacon! Visit the Town Cryer in any city to learn more! New rewards coming each month - keep an eye on UO.com for updates! 1. Will the Felucca Trade Ministers be turned back on? Yes, the Felucca Trade Ministers have been re-enabled in the latest publish. 2. Can we please get more areas/mobs that drop the Red Daemon armor? As we add new content we will keep this in mind for potential loot drops. 3. Will we ever get a search feature on the Jewelry box? Yes, we are aware and have heard this request several times, we do have it written up and in the system to add. We plan to add this functionality in a future publish. 4. Can we get a deposit only setting for wall safes? Yes, we will be adding this feature to a future publish. 5. The regs from the cat promo statue will not stack with normal regs that are either purchased or picked up off the ground, is there anything we can do about that? We have confirmed this is happening and will be looking into a solution for a future publish. 5. Will the auto open corpses feature be added to the EC? We have a number of EC performance and utility improvements scheduled over the next several publishes, and can add this feature to the list we'd like to implement. 6. Do you have any plans to address the discrepancies with books written in the EC vs the CC? Yes, this is something that will be addressed in our next publish. • How to create an account or log into my account? • How to manage my accounts after I’ve logged into the Account Center? Rising Tide will be deployed manually to Origin, Izumo, & Baja today. Check out the latest publish notes for the full list of updates. Please note, until Rising Tide has been deployed world wide character transfers to/from other shards to/from Origin, Izumo, or Baja will be disabled. We are currently planning to deploy Rising Tide world wide on March 19, 2019. 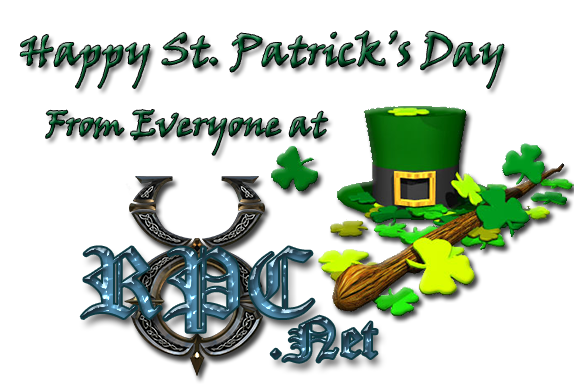 We want to make a very special thank you to everyone who visited TC1 and provided feedback. 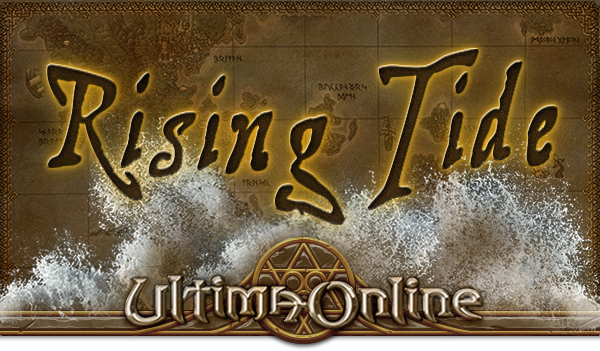 We are pleased to announce the next final update to Test Center of Rising Tide will be available after 4pm ET! This update focuses on a variety of bug fixes, as well as some tweaks to the Rising Tide event! Check out the publish notes for full details! We are planning to release Rising Tide to Origin, Izumo & Baja next week, and barring any issues, World Wide the following week. Please also note – this release includes a mandatory client patch. You will need to patch your client before logging into all shards. The story continues in the lead up to Rising Tide and we invite you to sit back and enjoy, The Guild. “We all like him. I don’t think he’s serious though. He’s just waiting for someone to meet his price, if you know what I mean.” Mole rubbed his thumb across his stubby fingers a few times. Mole grabbed the silk bag with his grubby fingers and gave a small bow. The balding man drained the last gulp from his flagon before scurrying off. Dalgrin finished his whiskey in silence. Dalgrin headed back to the ship he owned and captained: the Golden Kraken. Bribing Glenno would take more than drinking money, so Dalgrin would need gold from his captain’s chest. Walking down the docks, he noticed the deck of his ship appeared almost empty, save for a man with a parrot on his shoulder. The man handed something to the bird and whistled. The parrot flew toward Dalgrin and dropped what it was carrying. The shadow iron doubloon landed at Dalgrin’s feet. “This isn’t the first black spot I’ve received. I learned to duel from the finest trainers in Jhelom.” Dalgrin charged Hook, the first slash of his cutlass coming within an inch of the other man’s face. Dalgrin felt the cold of the paralysis spell before he saw the mage step out of invisibility. His sword hand stopped responding to his will. Helpless, he watched as Hook stepped up to him. “Did you really think you would be master of the Den? The pompous lord turned pirate? You are more hated than I am.” Hook plunged a long kryss into Dalgrin’s chest and twisted. Dalgrin slumped to the deck. The mage, Rankin, knocked on the hatch down to the hold. A group of orcs swarmed from below. They were all covered in blood. We would like to thank everyone who has participated in testing the Rising Tide event so far! The turnin data has been reset based on recent tweaks and encourage everyone to participate in testing the event during our public test event this weekend – the time for feedback is running out! Please also note – if you plan to test anything on TC1, especially any cannon related changes and the event, you will need to patch up to get the latest client. When you head back to production, you will see this updated client text – do not be alarmed, this is normal and expected behavior. 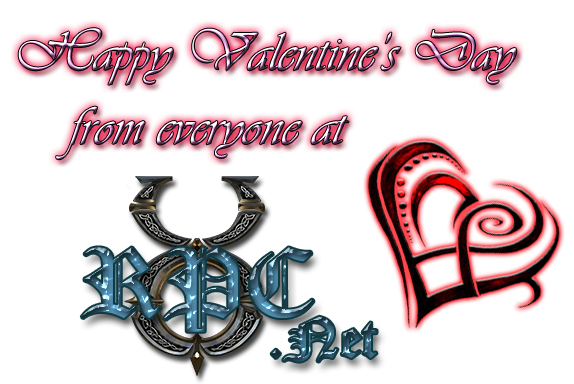 Thes Cupids are being built manually and we appreciate your patience as we place the dispenser on each shard. 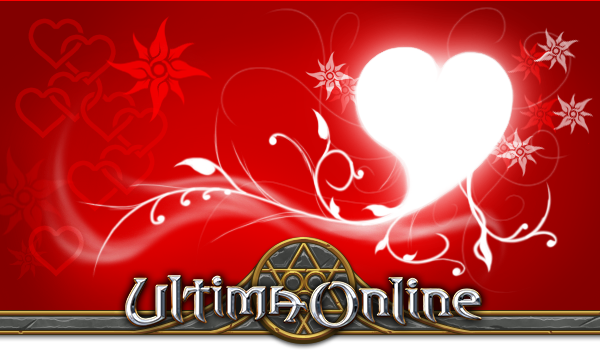 This website is not affiliated in any way with Electronic Arts or Mythic Entertainment. Content and images are the copyrighted intellectual property of their respective creators.